Jason Rogers, 12, a seventh-grade student at Bondurant Middle School in Frankfort, likes sports and plays football, basketball, baseball and soccer. He also likes math and, if he doesn’t get to play professional sports when he grows up, he wants to be an engineer. Jason is one of 150 African American boys from five Frankfort and Lexington middle schools who are spending several weeks this summer gaining hands-on learning experiences with advanced technology through a first-of-its-kind program designed to inspire minority males to explore education and career opportunities in STEM (science, technology, engineering and math) fields. 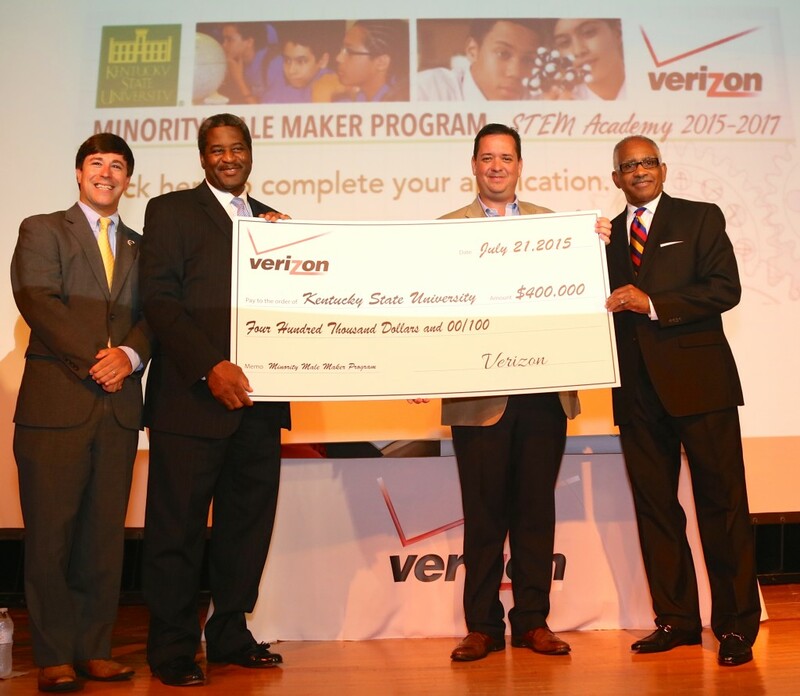 Minority Male Maker is a two-year program created by Verizon and launched this month at Kentucky State University with a $400,000 Verizon Foundation grant, the largest grant in the Midwest area in the Foundation’s history. The program seeks to empower a new generation of minority men by giving them lifelong technology and entrepreneurship skills to build future innovations and create brighter futures for themselves and their families. Kentucky State University is one of just four leading Historically Black Colleges and Universities (HBCUs) in the nation that are housing this pioneering program, instructing the students daily during intensive, all-day technology classes on campus this summer. Participants are also being mentored by minority college men, in collaboration with the National CARES Mentoring Movement. Minority males are severely underrepresented in STEM fields, according to the National Science Foundation. They also are less likely than their Caucasian peers to graduate from high school in four years, according to The Shott Foundation, or to pursue college, according to the National Center for Education Statistics. While much attention has been paid in recent years to empowering girls in these subject areas, very few programs exist that specifically work with boys to spark their interest in STEM disciplines. Students are participating in all-day workshops at Kentucky State University for four to five days a week from July 6-24, 2015. The curriculum at each HBCU location is unique and includes skills such as collaboration, presentation making, entrepreneurship, critical thinking, problem solving and a range of STEM disciplines, including app design and development, 3D modeling, design and printing, and robotics. Each participant will create a simple game through instructor guidance, create a model to “manufacture” on a 3-D printer, and brainstorm ways in which their game and model can be commercialized. During the 2015-2016 school year, the students will participate in additional sessions once to twice a month that will include mentoring and support in their academic progress. The impacts of the program will be measured by a combination of surveys conducted with the students at various stages during the program. Changes in students’ academic performances will also be tracked. Students recruited for the program are from the following Frankfort and Lexington-area schools: Bondurant Middle School, Elkhorn Middle School, Frankfort Middle School, Carter G. Woodson Middle School and Crawford Middle School.